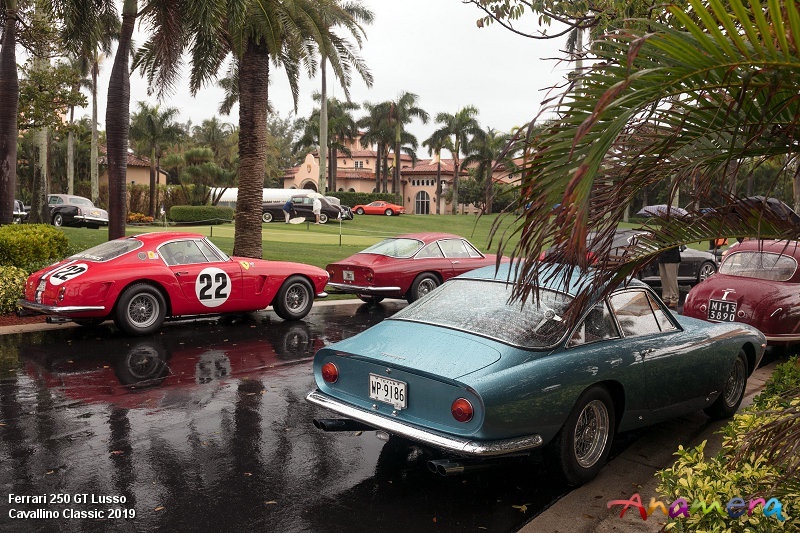 Rained out... this year's Cavallino Classic in Florid ended like they began on Thursday during the private track day at the Palm Beach International Raceway, with torrential rain. Whereas the Concours on Saturday at the lawn at the Breakers suffered from various showers this day at the Presidents Country Club, the famous Mar-a-Lago, saw nothing but rain during most of the day. After the wet days before the lawn was flooded in parts when the cars arrived in the morning and after a first try to reach their destination on the field the surface appeared too wet and deep to take the load of the cars and as even a light Aston Martin DB 2 left scars in the grass one could only imagine what a Bentley Speed Six or a big Packard would have done to the show field, so the decision was made to keep the cars in the parking and the driveway. Not too many cars did show up anyway as the weather forecast did not leave any hopes for an improvement. So some cars coming purely for the display at Mar-a-Lago never left the transporter the whole weekend, most prominent example possibly the huge Cadillac V16 Hartmann Roadster that stunned so many people at Pebble Beach last year. Of the cars seen the day before a duo of 250 GT SWB and a trio of 250 GT Lusso made it to the field as well as the two big bore Ferrari racers, the 335 S and the 410 Sport. So the judges did not have to spent too much time on the field to look after the car and both the judges, the owners and the paying guest soon made it into the pool house for a cocktail or a coffee waiting for the ballroom to open for the brunch. After enjoying a manifold buffet the awards were given and one had the impression that actually more trophies were available than cars on display despite the fact that some were brave enough to drive through the puddles on the way from the Breakers to Mar-a-Lago. So this might have been the wettest Cavallino Classic ever... there have been days of rain in the past but it might have been the first time that apart from a single track day every activities was help in the soaking wet and although Florida is called the sunshine state the weather could be crazy sometimes. Just a few miles north the annual 24h of Daytona suffered from the same fate as a lot of the race was under yellow until the race ended early. Let´s hope that this was the only time the Cavallino Classic has to suffer in the upcoming years as the show field certainly deserved better than that.